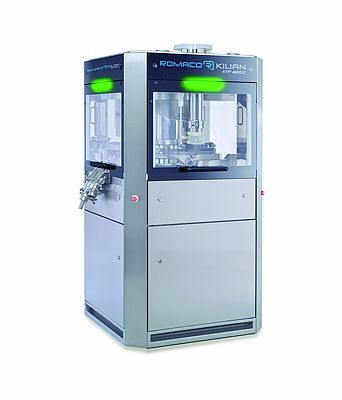 At the last Pharmtech exhibition in Moscow, Romaco showed its BIPAK vertical cartoner in line with the PAK 130 case packer in the semi-automatic standard model. With this version, the products are fed manually to the Promatic BIPAK and positioned in the open cartons from above by the machine operator. The feeding conveyor provides sufficient space for four persons and can be extended as required. This user friendly cartoner is ideal for the secondary packaging of upright products such as bottles or jars as well as for inserts like spoons, pipettes or booklets. The operator can switch the machine between continuous and intermittent motion, depending on the application. A simple setting on the HMI suffices. All in all, the Promatic BIPAK is a very versatile system: the basic machine is delivered with all the tools that are required to process the complete product range of the cartoner. At the customer’s request, the machine can also be configured with a pick & place system, which feeds the products automatically. The Promatic BIPAK achieves a maximum output of 120 cartons a minute. Reliable processes and long servicing intervals are further hallmarks of this vertical cartoner. The in-line Promatic PAK 130 case packer, which packs the folding cartons into shipping cases, is semi-automatic too. This machine groups, stacks and inserts the cartons fully automatically. The only manual steps are case erection, feeding and removal again after filling. An output of up to five shipping cases per minute is possible with the PAK 130, depending on the dimensions of the packaging. A system for closing the carton flap with adhesive tape can be installed as an option. The case packer has a compact, ergonomic design and is easy to set-up and clean after product changeovers. What’s more, the technology is altogether affordable to purchase and inexpensive to maintain. The Promatic PAK 130 is hence the perfect final packaging solution for numerous line configurations.